When Google pushes out Gmail 5.0, an update that will for sure include a full Material Design makeover, another accompanying feature may end up being the star of the show for many. 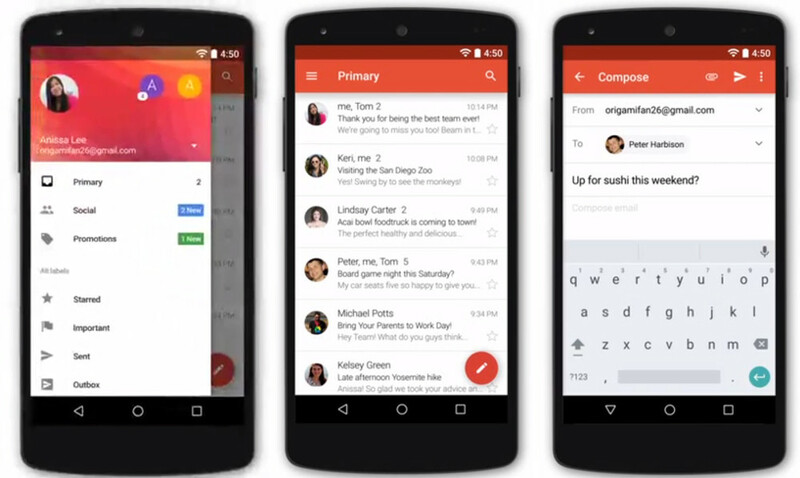 How would you like to access your third party email accounts through the Gmail app? According to the Gmail 5.0 app that we just poked around inside, the app is going to support Yahoo, Outlook and “more” email services very soon. The new Gmail 5.0 app surfaced through the Nexus 4 ROM we referenced in a post earlier this morning about Google Play Music’s upcoming makeover. After opening the app for the first time, you are greeted with a welcome page and video that was first reported by Android Police. That video walks through the all new Gmail design, but finishes by showing off support for Yahoo and Outlook addresses. In other words, you multi-account users who want to use a single app for email will soon have another option. It’s tough to tell when the update will arrive, but November 3 is a likely choice, since that is Nexus 9 day. And again, the new Gmail 5.0 is available through that Nexus 4 ROM, it just may not be the most secure app on the planet. You can install it if you’d like, I just won’t recommend doing so.